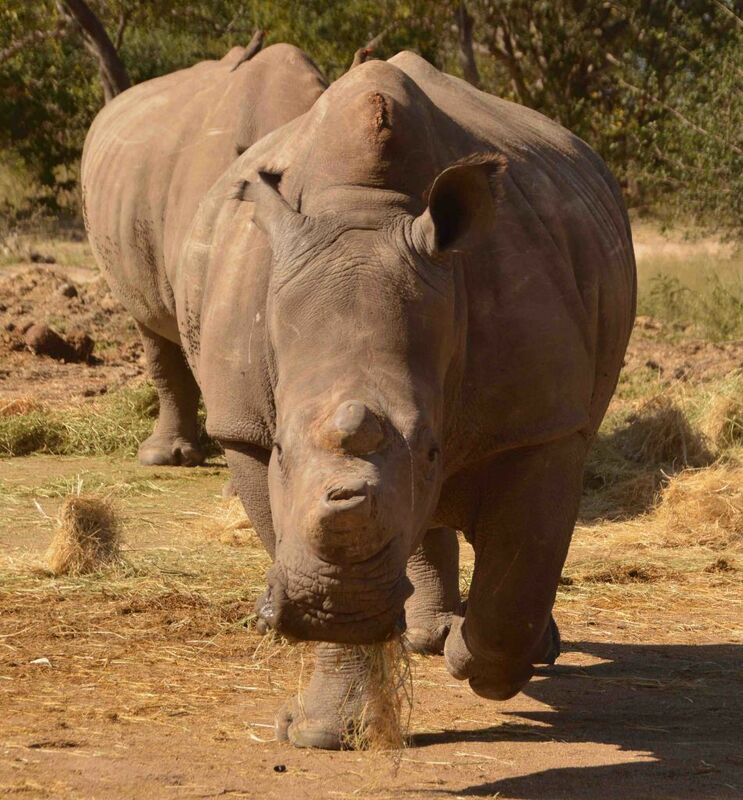 The Incredible Journey of Dingle Dell and Lion’s Den, two brave survivors of rhino poaching. 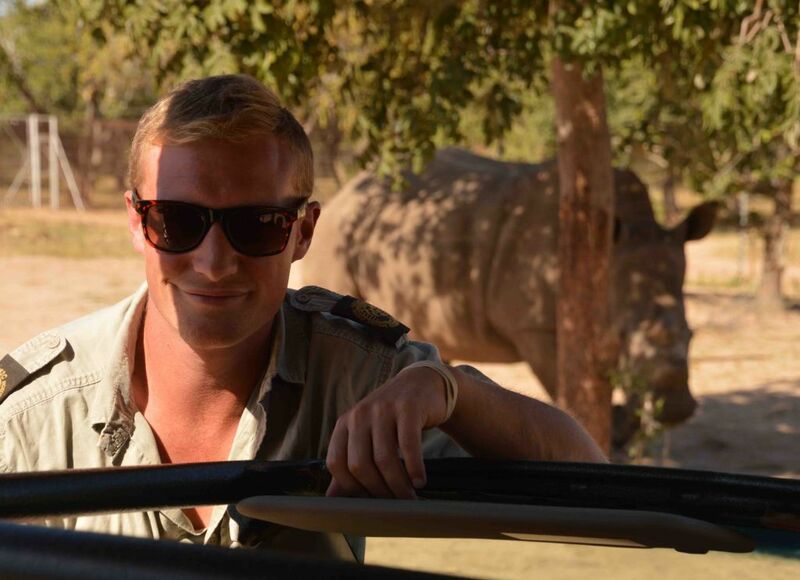 There are two extremely brave Rhino’s in our care at HESC. Their names are Lions Den and Dingle Dell, both of which are females. Dingle Dell and Lions Den as seen today, strong and healthy. They were brought to HESC on the 4th September 2013, after a brutal attack on these two cows as well as a bull, who sadly did not make it. 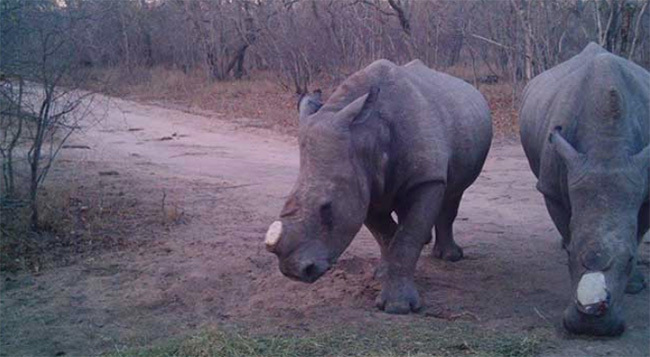 They had been darted by rhino poachers, and their horns removed with a chainsaw, which left their sinus canals open and exposed, life threatening wounds. 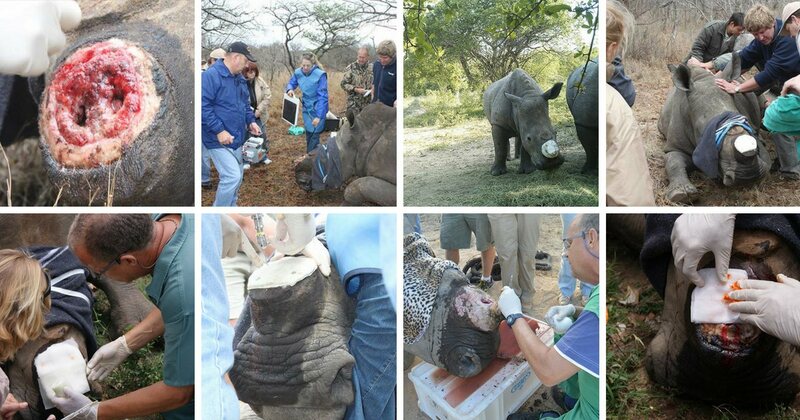 We had a big challenge upon us, and were fortunate to have the help and guidance of leading Wildlife vet, Dr Peter Rogers; Dr. Gerhard Steenkamp, a well-known veterinarian dentist and senior lecturer at the University of Pretoria; and Dr. Johan Marais (equine and wildlife surgeon and lecturer at the University of Pretoria). And so started the process of trying to heal these two victims. Over the next few months they endured many procedures, and Dingle Dell’s wound healed relatively quickly. By late January 2014, she had almost full recovered. However Lions Den’s wound proved to be a bigger challenge, which took over 25 procedures, and 18 months to heal well. Lions Den and Dingle Dell in the healing process. But the hard work, dedication and perseverance by all paid off, and five years later, we have two very healthy rhinos, and a success story. Their horns have grown back, though Lions Den’s has an abnormal shape, that makes it easy to identify her. We dehorn them regularly for their safety. 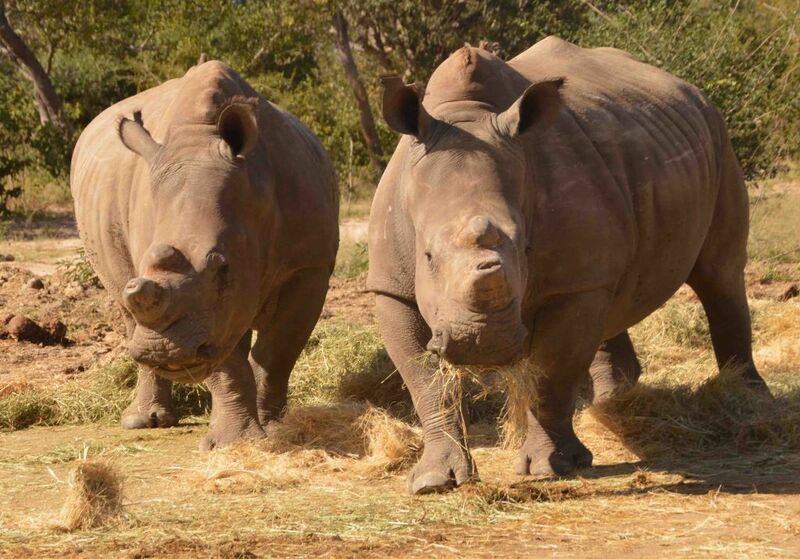 They share a large piece of land with two male rhino’s, Gertjie and Matimba, who are both orphaned rhino’s . Our guided tours of HESC do pass through their piece of land, and with a bit of luck, visitors will be able to see them in their happy environment, together. Dingle Dell and Lion’s Den never leave each others side. Dingle Dell and Lion’s Den can often be seen on our HESC daily tours. Seen here with assistant curator, Juandrey. Thanks for theese good news.